By far the majority of the salt in seawater consists of table salt, sodium chloride, NaCl. This salt is composed of two ions, sodium ion (Na+), which has a positive charge and the chloride ion (Cl-) that has a negative charge. Fresh water has a much lower concentration of salts. A fundamental law of nature requires the two streams to mix and attempt to create an equilibrium when they come in contact. This tendency can be expressed in terms of osmotic pressure. The osmotic pressure of a solution (e.g. of salt in water) is always higher than the osmotic pressure of a salt-free solution. 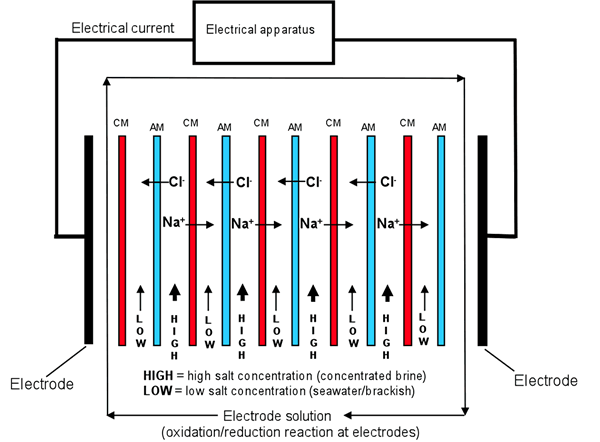 In reverse electrodialysis, cation and anion conductive membranes are placed in an alternating way in order to produce diluate and concentrate compartments as illustrated in the Figure below. The combination of a cation conductive membrane, an anion conductive membrane and the two corresponding compartments are called a cell pair. The concentrate compartment (HIGH) is then filled with the high concentration salt solution while the diluate compartment (LOW) is filled with the low concentration salt solution. The salt concentration difference (salt gradient) between both compartments in the cell pair creates a Nernst potential across the cell pair which causes an electrical current to flow through the electrical load connected to the electrodes.